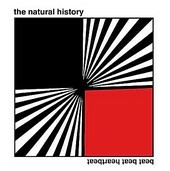 New York City-based indie-rock trio, consisting of brothers Julian (bass) and Max (guitar/vocals) Tepper, and rounded out by drummer Derek Vockins, The Natural History's debut full-length, Beat Beat. Heartbeat is a slightly math-rock influenced powerhouse of slicing guitars, stop-start rhythms, and plenty of juice keeping the songs flowing. With enough oddities and off-kilter riffs to keep things interesting, The Natural History spin indie-rock on its head, conforming to no rules as they go about writing their songs with a seemingly important goal: to have fun. And Beat Beat. Heartbeat, though offering up plenty of meaningful lyrics, is ultimately fun and entertaining. I'll give it a B.